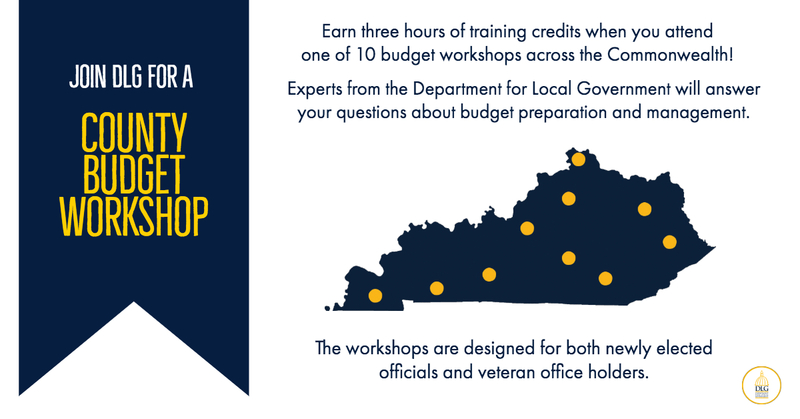 Join DLG’s team of experts as they provide budget information and answer questions to prepare county officials for best practices in budget preparation and management. The workshops are designed for newly elected officials, as well as a refresher course for veteran office holders. Each DLG workshop will provide three (3) hours of training credits, with lunch immediately following the workshop. Pre-registration required – see link below – to help staff plan for materials and lunch guarantees. Please note: Barren River ADD was 3/7/19, but has been changed to 3/14/19; Lake Cumberland ADD was 3/8/19, but has been changed to 3/15/19. These dates have been updated on the registration page.